I am not related to Ann or John, however are you aware of the relationship between Ann and Henry Perts? They applied to marry in May 1822 and appear to have been together for a number of years (until about 1828). Henry was listed in the 1825 census with Ann as “his wife” although it does not appear they were formally married. She appeared for him in 1828 when he was charged and convicted of selling spirits illicitly. I am extremely interested in knowing all I can about Henry and wondered if you had any information about him at all. John Curtis was probably born in Daglingworth/Bristol England c 1750 and was married at St Phillips and Jacobs in Bristol to Jane Purrier in 1773. They had 10 children. John practiced accountancy until the early 1790’s . In March 1795 he was tried and convicted at the Lent Assizes in Gloucester on 4 counts of “forging, counterfeiting, coining . . . silver coin of the realm called a sixpence”. He was sentenced to 7 years which was transmuted to transportation to Australia. He left England on the Ganges in August 1796 and arrived in Sydney on 2 June 1797. 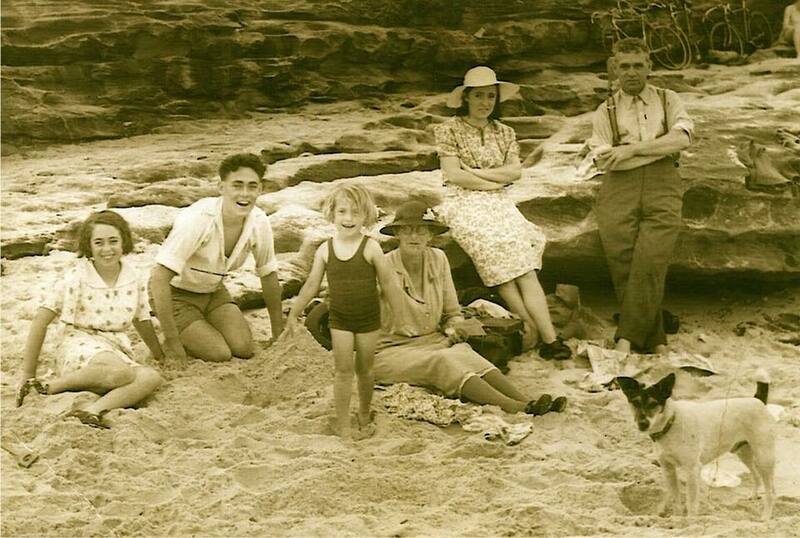 In his first years in NSW he worked for the Government as a dairyman at Toongabbie. He was promoted to overseer and Superintendent of the Government herd in 1802. 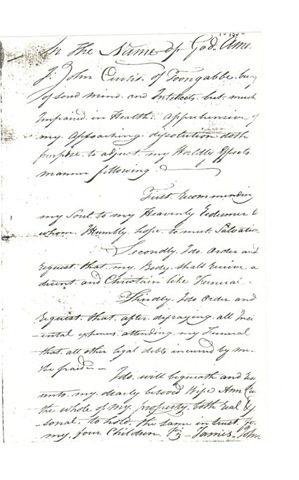 John was emancipated on 4 June 1802 and the next year petitioned Governor King for permission to return to his family in England, unaware that his wife, Jane, had died from consumption in 1800. Despite his good reputation and that Governor Patterson, George Johnston and Rev. Marsden signed his plea he never returned to England. 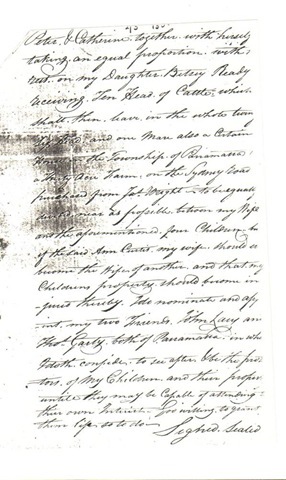 In 1802, an Irish convict, Ann Moran arrived in NSW and was assigned to work for John. They eventually married in 1814 and had 5 children (not necessarily in that order). 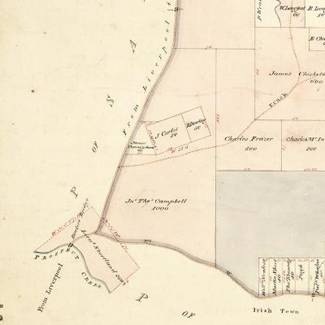 In 1809 John was granted 80 acres of land at Liberty Plains (now Chester Hill), Sydney. Curtis Rd in Chester Hill runs across part of this land grant. By 1821 he owned a house in Parramatta, which he left to his oldest daughter, Betsy, 26 head of cattle and a mare, a 30 acre farm on Sydney Rd, near Haslem’s Creek (now Lidcombe), adjoining a grant of 100 acres made to Ann after John’s death. This land stayed in the family. The Villawood Migrant Hostel in Millers Rd Villawood stands on John Curtis’s original estate. This is from “Kings Papers” in Sydney Library. It was sent to me by Ken Eccleston about 15 (?) years ago. Looking at the handwriting it is very similar to my father’s handwriting (also a John) – he always had the reputation of having beautiful handwriting when he was young; may be it is inherited. Dad was also an accountant. John died on 12 September 1821 and is buried at St John’s Pioneer Cemetery Parramatta. Born c 1767 in Ireland. She was one of the first hundred Irish women convicts to come to Australia. She arrived on the “Hercules” in 1802 after being convicted in County Heath, Ireland. After arrival she was assigned to work for John Curtis1 They eventually married on 6 August 1814 at St John’s Parramatta, NSW, and had 5 children, not necessarily in that order. 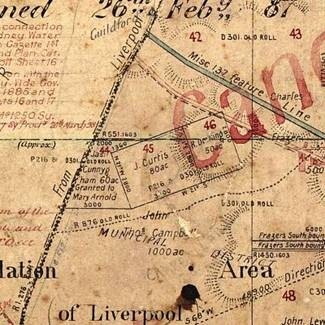 After John’s death in 1821 she applied for and was given a further land grant of 100 acres adjoining John’s original 30 acres in c1824. Ann died ion 6 October 1832 and was buried at the site of Central Railway Station in Sydney. Later the original cemetery was moved to the Pioneer Cemetery at Botany. 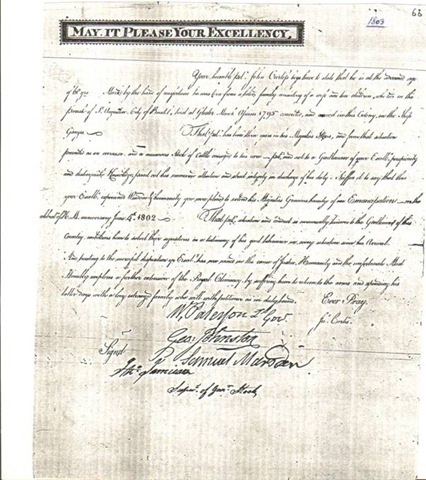 JOHN WAS GRANTED LAND ON 17 DECEMBER 1809 BY GOVERNOR PATTERSON. LATER CANCELLED AND THEN RE-GRANTED BY MCARTHUR IN 1810. SOME MORE BACKGROUND NATIONAL LIBRARY AUSTRALIA ARTICLES REFERRING TO PARRAMATTA OF THE EARLY 19TH CENTURY. On 17th December 1809 JOHN CURTIS was notified that Lt Gov Patterson had granted him land at Parramatta. THE Lieutenant Governor has been pleased to appoint Mr. James Larra to be Vendue Master to the District of Parramatta. By Command of His Honor the Lieutenant Governor, Alexander Riley, Secretary. Head Quarters, Sydney, Jan, 14, 1809. 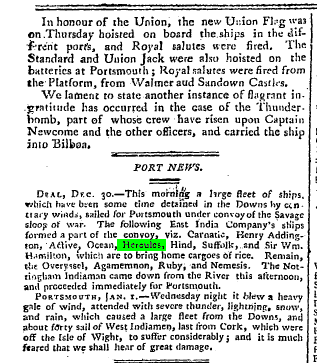 The Sydney Gazette and… Sunday 14 January 1810, page 1. SOME OF THE OFFICERS WHO HELD OFFICE BEFORE THE LATE GOVERNOR WAS ARRESTED ARE RE-INSTATED TO THEIR POSITIONS INC REV FULTON. Ann too was proving to be a marvellous help and mother and on Wed 3rd July 1811 gave birth to their third son PETER. Clear orders from the Governor regarding illegal brewing of beer and spirits in Sydney and in the out-settlements which included PARRAMATTA. A list of names of people granted licences. Ann Moran is not listed here but in later years is issued with a brewing licence. TO be SOLD by Private Contract, a very desirable FARM on the Road to Parramatta, from which it is scarcely a mile distant, known by the Name of Rafferty’s Farm, and now occupied by Mr. Edwards, The above is beyond dispute one of the most enviable Farms of its extent in the Colony, containing about 80 acres, and having a neat, commodious, agreeable, and substantial Dwelling-house near the high road, with every Appurtenance that can tend to convenience and accommodation, with Possession next July.- For particulars application is requested to Mrs. Walker, at the End of Cumberland street, towards Dawe’s Battery. As cattle were always straying through the burial grounds behind St Johns Church Parramatta, an appeal for funds towards enclosing the grounds was made, to which JOHN CURTIS subscribed ( Sydney Gazette Jan 1813). 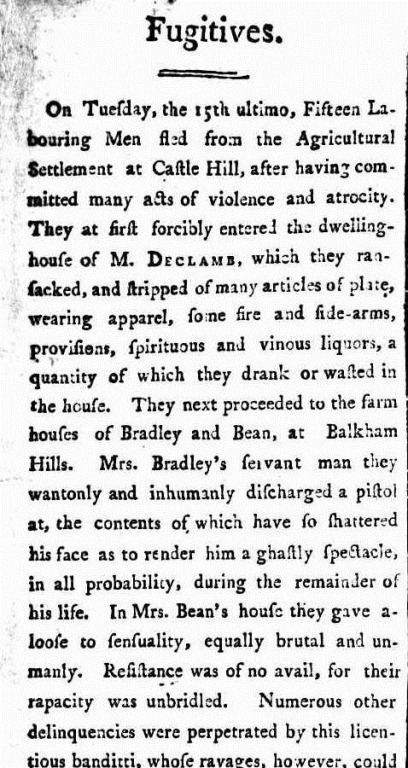 The Sydney Gazette and… Saturday 13 February 1813, page 4. An iron grey horse had also strayed – from Smith’s Paddock, at the PARK GATE near PARRAMATTA. The owner JAMES WRIGHT offered a 20 shillings reward. Catherine ( Kitty ) is born. The trial and tale of a sordid murder at the Turnpike at Parramatta. A story of RAGGED RASCALS and COARSE WOMEN. Of HOOLAGHAN and SUITAR. Of a yellow handkerchief and a piece of lead worn in an ear. 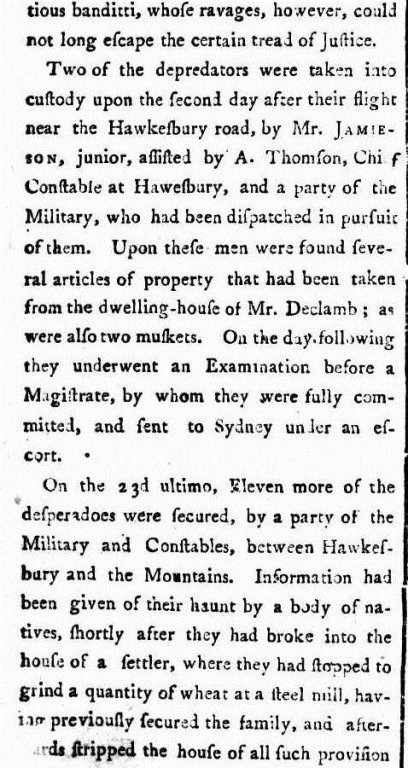 The Sydney Gazette and… Saturday 7 October 1815, page 2. The second Thursday of March meant that the half-yearly fair was to be held in PARRAMATTA and it was expected that it would be well attended. 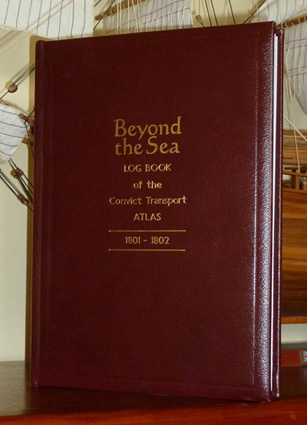 IN addition there is an account of a fatal trip to the Shoal Haven and of the party sent to look for missing men. The patronesses of the FEMALE ORPHAN INSTITUTION are named. Mrs Wylde , Mrs Molle, Mrs Hannibal MacArthur and Mrs Macquarie. THIS PRESENT SEASON OF SCARCITY. A calamitous season of floods leads to Government Orders regarding rations. Details are set out in the article. JOHN CURTIS AND ANN MORAN WERE GRANTED LAND IN PARRAMATTA IN 1809 . THE EVENTS OF THE CURTIS ERA WERE REPORTED IN THE SYDNEY GAZETTE – NOW THANKFULLY ONLINE. FOLLOW THE LINKS TO THE WORLD OF THE EARLY 19TH CENTURY OUT AT PARRAMATTA. EVERY Person throughout the Colony, professing the Roman Catholick Religion, is to attend at Government House, Parramatta, on Wednesday the 20th of April Inst. at ten o’clock in the forenoon ; previous to which, those residing about Sydney are to give their names, places of abode, &c. to the Rev. Mr. Dixon ; to the Magistrate’s Clerk at Parramatta ; and to Thomas Arndell, Esq, at Hawkesbury. By Command of His Excellency W. N. Chapman, Sec. Government House, April 12, 1803. REGULATIONS TO BE APLIED TO REV DIXON AND ALL CATHOLIC OBSERVANCES.inc police being stationed at all services. With other ROMAN CATHOLIC members of the community, JOHN CURTIS signed a petition to J T BIGGE for a ROMAN CATHOLIC CHAPEL when Bigges came out to the Colony to investigate and report on how it was going. ( 20 Feb 1820 Bigges Report app p 3943). 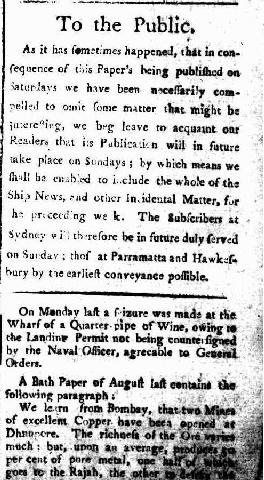 The Sydney Gazette and… Saturday 2 April 1803, page 1. 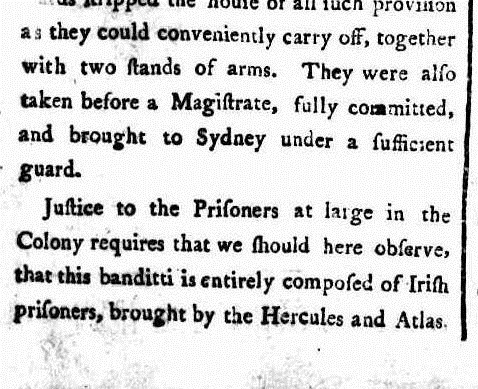 The Sydney Gazette and… Saturday 26 March 1803, page 4 EXECUTIONS RESULTING FROM CASTLE HILL UPRISING. the Magistrate’s permission for that purpose. 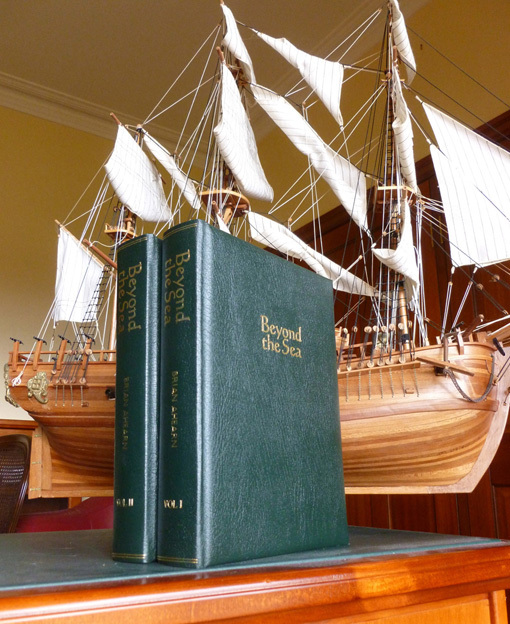 KING’S successor WILLIAM BLIGH had even more trouble with MACARTHUR and the NSW CORPS as he was more interested in discipline than seeing the officers get rich for he well remembered the mutiny of his crew on the BOUNTY. So while JOHN and ANN worked hard to build a future for their family which had grown to five with the birth of two sons, JAMES and JOHN, friction was building up between BLIGH and MACARTHUR. The smaller settlers and emancipists whom the Corps despised, backed BLIGH as he tried to bring the Corps under control and stop them abusing the privileges they had squeezed from his predecessors. On Friday 1st January 1808 as evidence of their backing they penned an address of loyalty to him , which JOHN CURTIS also signed. 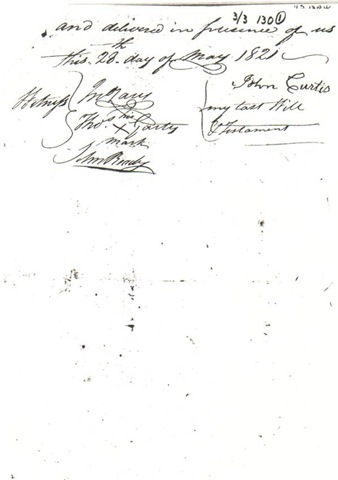 Unfortunately, under the threat of financial ruin along with other signatories, John was forced to retract and sign another in favour of MAJOR JOHNSTON when MCARTHUR and the more influential settlers , feeling threatened by Bligh, persuaded Johnston to depose BLIGH and assume command himself ( Banks papers. vol 622 captan bligh and nsw corps 1906 1811 p 301). As no provision had been made for settlers by the English Government when setting up the prison Colony, there was a great shortage of coins at this period so coins from other nationalities were put into use and IOUS and PROMISSORY NOTES came into circulation. John Curtis was unfortunate enough to lose one of these promissary notes and during March 1809 advertised in the papers for its return. ( Check the details on https://lynnesheritage.wordpress.com/2008/08/21/st-johns-church-parramatta-john-curtis-and-ann-moran/. They read a little differently with access to NLA ). Leaving Lt Gov Patterson in charge McArthur and Johnston made the mistake of going to England to explain their actions to the English Government which was not amused by the way they had deposed BLIGH. Major Johnston was casheered and John McArthur exiled from the Colony for 8 years. On 17th December 1809 JOHN CURTIS was notified that Lt Gov Patterson had granted him land at Parramatta. Eleven Days later Lachlan Macquarie Bligh’s replacement arrived and within a few weeks had assessed the situation and cancelled everything that had been done officially since Johnston had deposed Bligh ; all land grants, appointments and trials. It had been decided that the NSW CORPS was to become one of the ordinary regiments of the British Army and sent home. With staggering speed Macquarie started to clean up the mess he had inherited for he found the population continually threatened with starvation, the buildings decaying and the morals of most of the population in the lowest state of debasement whilst religious worship seemed to be in a state of almost total neglect. Arrival of the grain ship MARIAN a fortnight after Macquaries arrival followed by a mild autumn and bounteous spring partly relieved the problem of feeding the starving community and Macquarie was able to concentrate on other matters needing his attention. 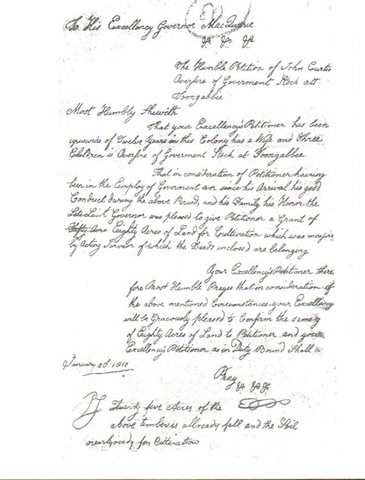 Cancellation of all land grants made during the rebel’s rule meant that JOHN CURTIS too lost the land granted to him by Lt Col Gov Patterson so he wrote a memorial to Gov Macquarie seeking confirmation of the grant. ( sm folio pp 4 1810 NSW Colonial Sec in letters and memorials 1810 AK NO 80 REEL 1066 AONSW). Macquarie as was his way when dealing with those he considered worthy emancipists acquiesced. The skills John was acquiring in the Colony coupled with those he had learned as an accountant in England were coming in handy and life was improving steadily for he appears to have been able to use some of the Government Land at the dairy for his own cattle. Ann too was proving to be a marvellous help and mother and on Wed 3rd July 1811 gave birth to their third son PETER. This was ANN’s 4th child but John’s 16th, two of his English children had died before he left England leaving 5 sons and 5 daughters there. During March 1812 there were again heavy rains and the Hawkesbury rose 12 feet over its banks. Flood years seemed to stir John’s spirit for on 7th December he further petitioned the Governor , this time for a free pardon which was granted. (NSW COL SEC IN LETTERS Petitions mitigating sentences 1811 – 1812 pp 110-111 reels 1227 and 612 ) (register of pardons and tickets of leave Vol 1 p 183 Col Sec papers COD ML ). On Tuesday 16 August 1814 in a ceremony at St Johns Church at Parramatta witnessed by Chistopher Grogan and Margaret Neale , JOHN CURTIS and ANN MORAN were married. This ceremony was followed by the baptism of 3 year old PETER and his baby sister CATHERINE ( Kitty) born on 7th June that year ( 1814) . A muster taken at this time lists JOHN, ANN and these 2 children as still being supplied from Govt Stores whilst the other 3 children were not. The CURTIS children grew as the years passed with all helping out on the farm as they became able . Elizabeth blossomed into a young woman and JOHN READY who lived nearby became interested in her. In 1829 when ELIZABETH was 17 and JOHN READY was 30 they were married. Because of John’s advanced age,( he was now 72), ANN CURTIS set up business for herself. On 21 April 1821 she paid into the POLICE FUND for 6 months brewing licence and a retailing licence ( Wenworth Papers dip 228). 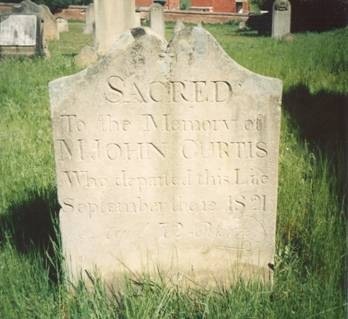 Almost six months later on Wed 12 September 1821 , John Curtis died and was laid to rest in the BURIAL GROUND behind ST JOHNS CHURCH PARRAMATTA.